BREWSTER, Mass. – In a year where it’s hard for a pitcher to find his groove due to postponed games and long rainouts which turn into doubleheaders, Shaun Seibert (Arkansas) has defied expectations and has helped pitch the Brewster Whitecaps into contention for the playoffs. Seibert is leading the Cape League this season in pitching with an impressive 6-0 record. Up to the last week of the season, he boasted a 0.00 ERA (which is now at 0.39 after he surrendered his first runs on July 31 against Harwich). 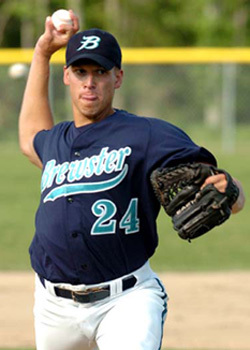 He also has 36 strikeouts in 45 2/3 innings pitched, helping to fuel a Whitecaps playoff push that currently sees them three points ahead for second place in the East Division with games remaining against Chatham and Harwich, two teams that Brewster has fared well against this season. He is going to be a junior this fall at the University of Arkansas and finished the 2006 school season with a 2.79 ERA, good for second amongst all pitchers on the team. In 10 starts, he had a 4-0 record and 62 K’s in 61 1/3 innings. Seibert will be used as a starter in the playoffs, which start Tuesday, August 8. He may be Brewster’s number one starter, as he has been all summer long, but Macaluso commented that it all depends on how the rotation works out in the final week of the season.